Today took a lot of reminders for me to be brave. I woke up early by spring break (and Daylight Savings!) standards to talk with the author of The Essential Guide to Getting Your Book Published, David Henry Sterry. He and his wife make up an awesome team that scours the country for book pitches to help new writers get published. As part of a promotion that they were running for their book, they invited surviving Nanowrimo participants (me!) to set up 20 minute phone consultations with proof of purchase. Even though this made me nervous, I decided to do it anyway. I was encouraged by their kind messages and honest/helpful input to other aspiring writers on their website. As much as I hate to admit it, however, I more than once thought about backing out, (I’m telling you, the introvert is strong in me, I just force it away on a daily basis!). There is something about sharing your creative ideas with others that feels very vulnerable. As I waited for my time to call, I found myself scribbling the words “Be brave. Be yourself. Be strong,” on my notepad. It turns out that I had nothing to be afraid of– David was great, honest, and full of tips that I look forward to applying to my pitch. In fact, I realized that it is not input that I fear at all, just how it is delivered, which in this case was very kindly. David definitely has a talent for coaching. He even asked to see my manuscript, which is really exciting to me. No matter what comes of it, it makes me think that someone may actually be interested in eventually publishing my book, once I get it all polished, of course. 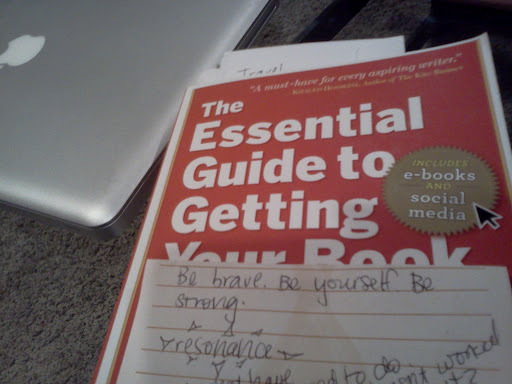 He also suggested that I start an author’s Facebook page, forcing me again to remind myself to be brave. Self-promotion can be intimidating, especially when my pitch and parts of my book still feel clumsy to me, but he shared that some publishers will not even look at your manuscript unless you already have an online platform. So, I set up a page, and, to my disbelief, it already has more than 80 followers (including people I do not know)! Being brave is making me feel very humble and grateful tonight. I just want to say thank you to everyone that has already shown support. And, for those of you that aren’t my friends on Facebook, I invite you to join my new “platform” by clicking like here, (I’d love to give faces to all of my mysterious Eastern European blog readers! Yes, Google Analytics tells me you’re out there!). Don’t forget, be brave too! After all, nothing ventured, nothing gained. If you’re writing a book, I highly recommend this guide, so much great advice!